The clipd is a simple linux daemon for displaying CLIP data (also known as CallerID) from analog telephone line on LCD display and/or web page. Callers data is stored in MySQL database. The program support lcdproc with 20x4 size display, but with a small modifications you can customize it to your own size. 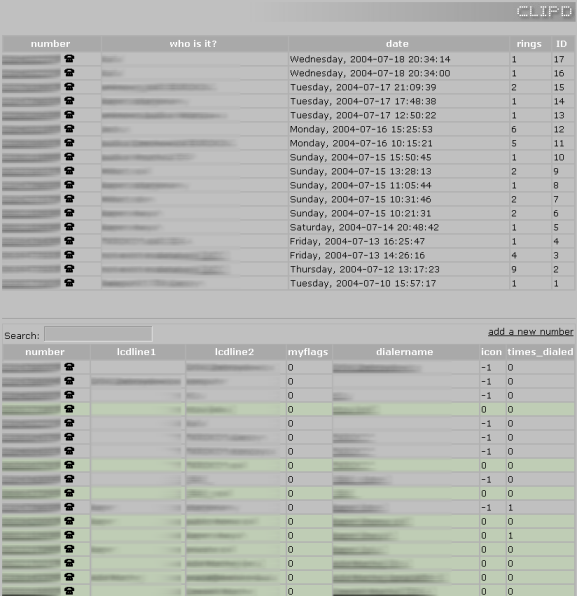 In package is also a php scripts needed to manage/show the callers database. Showing database, connection history, dialing, modifying and adding new callers are available via these scripts. When adding a new caller to db it has icon set to -1 by default - setting it to 0 will cause treating the number as cell and will display it with green color on page. Here is a screenshot of a php script output. When a first short RING is detected it add a new screen on LCD, then, when modem reads the CID data it is parsed and searched a number. Parsed number is searched in MySQL db - when found the caller data appears on LCD screen, else - only the number. The daemon also write to the connection history in MySQL database the number, date and time of a connection. If another call comes without clearing LCD, than the old caller is replaced with new caller data, making the last caller shown on LCD until clear. In MySQL exist new_callers table for holding number of callers, which was not shown on LCD when clearing display. It can be used to show only new connections in php scripts instead of all with small modification of php script. There are also actions for SIGABRT and SIGHUP signals. ABRT deinitializes and closes modem (use it for example before connecting with pppd) and on HUP signal modem is opened and initialized. There is also availability to send a defined in source code callers to a windows box via UDP. Just customize on which caller names it has to send a information to selected host IP with Windows and CallerID.exe process running on it. The metod is called NotifyOlo(), because of my brother's nick ;) When a info is received by CallerID.exe it raises a MessageBox with caller name and time. and the modem will dial it and disconnect just after it. This way of dialing is used in php scripts. To dial from web you just need to click a dialername or a phone logo right after a number. After dialing from scripts the times_dialed value for a selected caller is automatically increased. There is also possibility to call a user typed number - to do it just click anyone like you call to him and then type a number in edit box and press 'dial' button. Here is a pic of my LCD showing clipd data (under the heartbeat is a caller counter since LCD clear). - First of all look in all header .h files and check everything, customize it to your preferences. Much info is available in log file which is in /var/log/clipd by default.